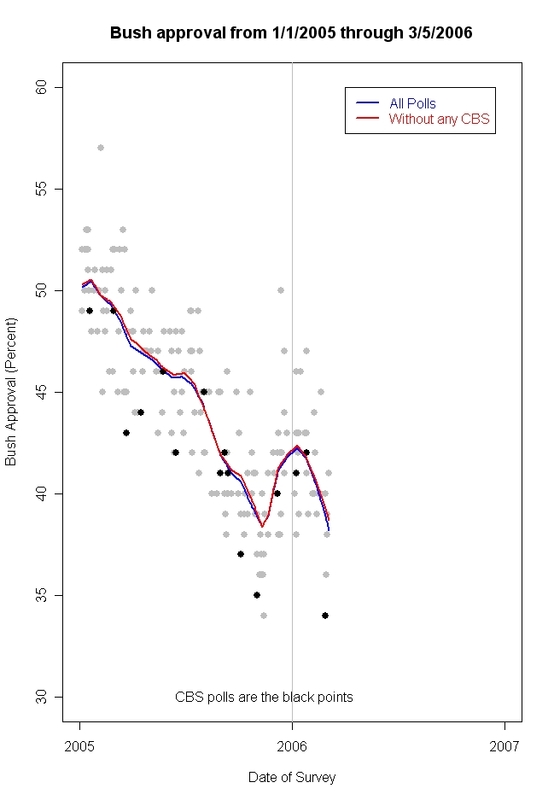 Estimated approval in all polls (blue line) and without any CBS News polls (red line). While the CBS News polls exhibit a house effect of -3%, meaning the CBS polls tend to fall 3% below the overall trend in 2005-06, the effect of including or excluding CBS polls from the estimation of the national trend in presidential approval is minimal. The red line (without CBS) very closely mirrors the blue line (with CBS). The latest estimate of approval, 38.2%, would increase slightly, to 38.6% without the CBS polls. Becuase there is no evidence here that including the CBS News polls affects my estimate of approval, I will generally avoid further comment and include these polls routinely, as I have in the past. There are various discussions of "house effects", both here in previous posts and on Robert Chung's excellent site here. 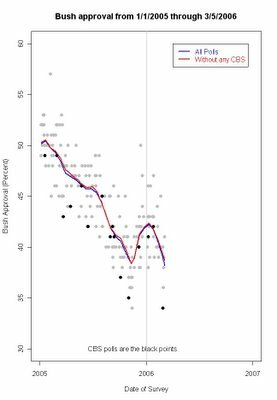 Interestingly, Chung finds that for 99 CBS News polls conducted since 2001, and including the most recent, CBS polls have actually averaged a small positive house effect, overestimating Bush support. That positive effect was larger earlier in the administration and has become smaller recently (to my eye, negative since 2004, which is the period in which I estimate the -3% house effect.) Read Chung's pages for the details. The graphics and the explanation are about the best there are. One of these days I'll get around to a full post and analysis on house effects of my own, but I believe my results are closely in line with Chung's except for differences in the time periods we use for estimation. While nothing I say here will stop the criticism of any poll that disagrees with partisan predispositions, and the selective interpretation of which polls are "accurate" and which are "biased", the data do in fact speak, at least to those willing to listen. New low or steady as you go? How low can approval go?